Just when all my boomer buddies are beginning to join me in the retirement lane, we get bad news. We were cruising along at 90 miles per hour in the work a day world, then hit the retirement zone where we’re slowed to 30 MPH without much warning. Just thinking about it gives me whiplash. So we go pick up some reading material, adjust the television set, get a bag of Zaps and settle down in the big easy chair for an afternoon of reading which stretches into the evening. Then, Boom! 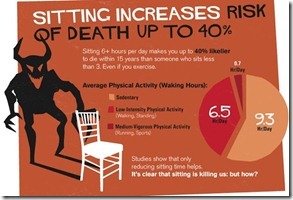 Out of nowhere they announce that sitting will kill us. What are “they” talking about and who the heck are “they” anyway? This mystical, magical group of supreme beings who have all the answers are beginning to get on my last nerve. You might want to stand up to read the remainder of this diatribe. Until recent times, humans spent their time roaming the woods, hunting wild boars or gathering berries. With the advent of television, computers and desk jobs, we’re sitting more. 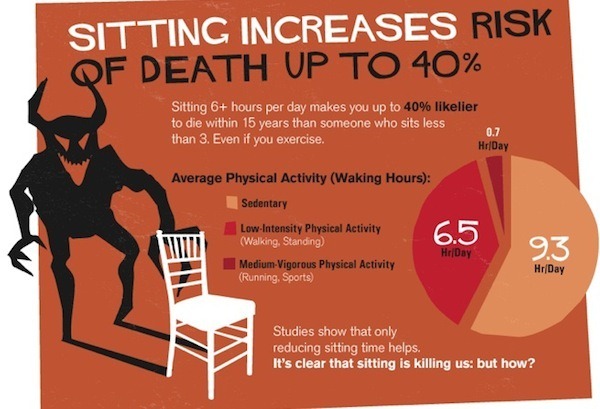 On average we sit about 9.3 hours a day – more than we spend sleeping. 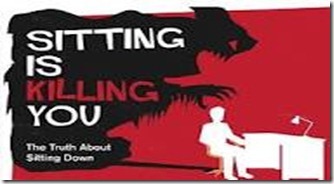 Sitting expends almost no energy. As soon as you sit, calorie burning drops to one per minute. Good cholesterol drops 20 percent after two hours of sitting. So, my friends, you better keep it movin’. Researchers have found that you can burn up to an extra 350-500 calories per day by accruing a whole host of lifestyle aerobic (walking) and strength (hauling fire wood, composting, carrying groceries) type activities in 24 hours. And this is gym free living. The National Institutes of Aging notes that you can prevent disease by simply increasing these “activities of daily living”. Heck, just get up and move more. Try this. Five minutes of every hour, assume the vertical. Set your alarm (a kitchen timer works) and just aim to get up for at least 5 minutes every hour and move. Walk around, stretch, run in place, clean a little more of that closet or walk the dog. If you don’t have a dog, borrow mine. The key is to try not to let 60 minutes go by without getting vertical. If, like me, your favorite activity is Movin’ and Tubin’ try this. (Hey, look I like my Law and Order episodes as much as the next person.) So get up during the commercials and do something.